Bill Marx has written a favorable review of “The Wired City” for The Arts Fuse, a Boston-based online arts magazine that he founded in 2007. Our paths crossed at The Boston Phoenix in the 1990s, and I know that Bill is a tough audience. Bill also offers a worthwhile criticism — that the hyperlocal sites I write about should do more arts coverage, and that I should have held them to task. He’s right. At one time the New Haven Independent’s lack of in-depth arts coverage was on my radar, but I failed to follow up. But let me offer two points. First, the Independent’s arts coverage is quite a bit more extensive today than it was when I was doing my research, with much of it funded by beat-specific grant money. Second, though this doesn’t quite get at Marx’s critique, both the Independent and The Batavian, the two sites I cover in the most detail, emphasize excellent photography. That visual appeal is part of what has made them a success. Many thanks to Emily Rooney for giving me a chance to talk about “The Wired City” on “Greater Boston” Monday evening. You can watch it above or on the “Greater Boston” website. I’m scheduled to talk about “The Wired City” on “Greater Boston” (WGBH-TV, Channel 2) with Emily Rooney today at 7 p.m., though I’m told I may get bumped for breaking news. I’ll update this if necessary. Tomorrow at 1 p.m. I’ll be a guest on “Boston Public Radio” with Jim Braude and Margery Eagan (WGBH Radio, 89.7 FM) to talk about “The Wired City” and to unveil a collaboration I’ve been working on with ’GBH. Exciting stuff! Hope you can tune in. 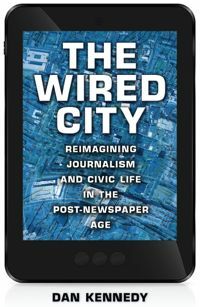 I am honored and thrilled that The Boston Globe asked its Pulitzer Prize-winning former Washington bureau chief, David Shribman, to review “The Wired City.” I’m even more thrilled that Shribman — now executive editor of the Pittsburgh Post-Gazette — liked the book. You can read the review here. As I mentioned yesterday, this Thursday I’ll be speaking about “The Wired City” at the GlobeLab, which is part of The Boston Globe. It’s going to be an informal get-together starting at 6:30 p.m. If you’d like to attend, and I hope you will, please sign up here. More: Adrienne Debigare interviewed me for the GlobeLab blog. Many thanks to Paul Bass, editor and publisher of the New Haven Independent, and Will Baker, director of the Institute Library, for a terrific event for “The Wired City” last Thursday. It was great to catch up with folks I hadn’t seen in quite a while and to meet new people. 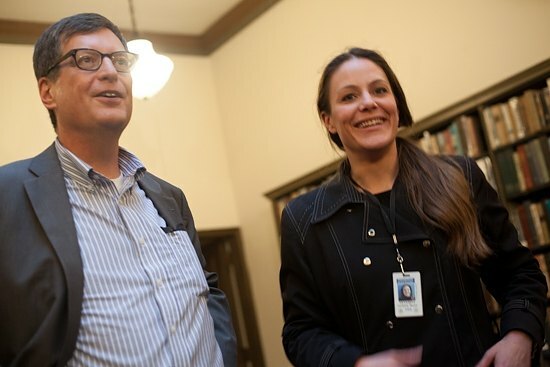 The Independent’s Thomas MacMillan covered the event here; the New Haven Register’s Randall Beach and Melanie Stengel here. Closer to home, Will Broaddus of The Salem News interviewed me last week for his book column. I’ve got three events coming up during the next week that you might be interested in. • On Wednesday at 6 p.m. I’ll be part of a panel that will discuss the New England premiere of “Corporate FM: The Killing of Local Commercial Radio,” directed by Kevin McKinney. It’s not cheap, but it’s for a good cause: The event will benefit WHAV Radio, an independent online-only radio station based in Haverhill. The screening will take place at Chunky’s Cinema Pub, 371 Lowell Ave., Haverhill. You can find out more here. • On Thursday at 6:30 p.m. I’ll be doing an event for “The Wired City” at the Globe Lab, which works on new technology projects for The Boston Globe. The lab is located at the Globe, which is at 135 Morrissey Blvd. The event is free and open to the public. • Next Monday, June 24, I’ll be sitting down with Emily Rooney to talk about “The Wired City” on “Greater Boston,” on WGBH-TV (Channel 2). Photo by Thomas MacMillan for the New Haven Independent. Thursday morning update: You may have heard that heavy rain and wind are predicted for today. I have been in touch with the Institute Library, and the event is on. Hope to see you there. If you’re in the New Haven area, I’ll be at the Institute Library on Thursday at 7 p.m. to talk about “The Wired City.” Details here.